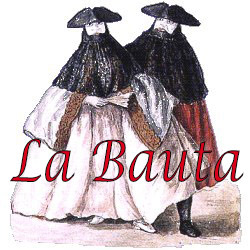 La Bauta is one of the few craft workshops still in Venice where papier-mâché masks are produced every day, following the ancient tradition of “mascareri” that dates back to the early twelfth century. All our creations are rigorously made and painted entirely by hand, making our masks unique and special both to wear them on a particular occasion, and to adorn the walls of your homes in an original way. In the 15 years of our work we have created more than 220 sculptures and have a wide choice of more than 500 models starting from traditional carnival masks, passing through those of the art comedy and even the most modern ones. All our masks come to life from strips of moistened paper, simply processed with flour and water, applied in layers superimposed in handmade plaster molds. After drying, a patient work finishing with abrasive paper to obtain smooth surfaces ready for decoration. From here begins the most beautiful phase that is that of decoration, where using ancient traditional techniques such as “stucco”, gold and silver leaf, acrylic colors, decoupage and antique shading with bitumen, finishing with macramé, pearls, trimmings and natural feathers are born our creations each one different from the other, unique pieces of real craftsmanship born from love and passion for what we do, for masks and carnival and especially for this beautiful city, Venice. And if then among all our masks you can not find the one that suits you, we are ready to listen to your requests, your suggestions, your wishes and together we can make the mask of your dreams.